Typically, the most popular two M3’s at any given point in time are the original and whichever generation is currently in production. This is easy to understand, as the E30 model has long been recognized as one of the finest handling cars of any type ever built, not to mention its status as an iconic, limited production homologation special. Though turbocharging and ever-increasing weight and complexity means some of the purity of earlier cars has been lost, each successive M3 (or M4, as the case may now be) has been faster and more capable, offering cutting-edge performance and tech in a practical, relatively unassuming package as per the enduring template laid out by the ur. For us, the sweet spot somewhere in between these two bookends lands squarely on the E46 M3. These third-gen cars marked, in BaT’s opinion, several peak-M3 characteristics, including final evolutions of BMW’s classic naturally-aspirated straight-six and traditionally functional, unadorned (read: German) styling themes. They’re just the right size too, offering a comfy cabin for two adults, a couple of kids, and a week’s worth of groceries or vacation luggage for all four inside a fairly compact package, and though electronic driver aids aren’t entirely absent from the spec sheet, the relative sparsity of buttons, screens and driving modes keep fussy distractions to a minimum. The E46 M3 is undoubtedly one of the all-time great M cars, and this is why we love them. Introduced at the Geneva International Motor Show in October 2000 as a 2001 model, the third-generation M3 first hit the streets about two years after standard E46 3-Series models. Timeless styling followed that seen on more run-of-the-mill coupes and convertibles closely, but with wider fenders (incorporating E9-style grilles in the front), unique side moldings with integrated markers, an aluminum hood with a raised power dome, wider kidney grilles, deeper front and rear valances, quad tailpipes, clear turn signal lenses, and aero side mirrors. The resulting car was clearly something special, but remained subtle enough to fly under the radar, especially when paired with standard 18″ wheels and an unassuming color like factory code A08 Silver Grey Metallic. Other OEM paint options included Alpine White III (code 300), Imola Red II (405), Jet Black (668), Laguna Seca Blue (448), Carbon Black Metallic (416), Black Sapphire metallic (475), Titanium Silver Metallic (354), Steel Grey Metallic (400), Topaz Blue Metallic (364), Mystic Blue Metallic (A07), Interlagos Blue Metallic (A30), Oxford Green II Metallic (430), and Phoenix Yellow Metallic (445). Check out this link for a detailed breakdown of color availability by spec and year. Though the E46 M3 was only offered as a coupe or convertible, the Bavarians did seriously consider a wagon, or in traditional BMW nomenclature, a Touring. Likely conceived as a potential B5 Audi RS4 competitor, the company went so far as building a fully-finished concept, however it was never publicly displayed while the E46 was still in production. Had it been given the green light, we’d probably say the Touring was the one to have, but today our preferences run towards 6-speed manual coupes with the ZCP or Competition Package (CS in the UK). Debuting in December 2004 and optionally available only on coupes, much of this sought-after package’s spec was derived from the limited-production, Euro-only CSL, including larger 13.7″ cross-drilled, two-piece front brake rotors and a faster steering rack ratio, reduced to 14.5:1 from 15.4:1. Other changes included an M Track Mode for DSC (Dynamic Stability Control), which raised the system’s intervention threshold to allow more sideways shenanigans. Special 19″ cross-spoke wheels were also very similar to those seen on the CSL, albeit half an inch narrower in front at 8″–rears were essentially identical at 9.5″ wide. Trim differed slightly too, and Interlagos Blue was unique to ZCP-equipped cars. Including UK-market M3 CS models (as seen above), total ZCP production peaked at 3,011, making them nearly as scarce as the Euro-only CSL, of which 1,383 production versions were built between June and December of 2003. In a nutshell, the CSL (for Coupe Sport Lightweight, harkening back to the legendary 3.0 CSL “Batmobile” of 1971) was true to its name, utilizing several unique composite body panels and thinner glass to shave roughly 10% from the standard car’s ~3,400 lb curb weight. Offered exclusively with a tuned version of the SMG II roboticized 6-speed and fitted with a CSL-exclusive carbon airbox and low-restriction air flow metering, power jumped from the standard E46 M3’s 338 HP (ROW, North American spec cars delivered 333) to 360, the additional horses bringing with them one of the greatest induction roars ever heard in a standard production car. A host of additional changes included different camshafts, exhaust valves, a lightweight, thin-walled exhaust system, extensively revised suspension tuning, a largely stripped interior and much more. The above chart tracks BaT Auctions sales results for E46 BMW M3 coupes and convertibles, as found on our BaT Model Page here. While sub-350 HP may not be terribly impressive by 2018 standards, it’s really more than enough in an E46 M3, which in a well-driven 6-speed manual car should be good for high four-second range 0-60 MPH runs. Perhaps even more importantly, output is always ample to get the tail out on demand, thanks in no small part to BMW’s brilliant M Differential. Standard on all E46 M3’s, this fully mechanical, locking type unit is activated when a rotational speed difference is detected between the rear wheels, pressurizing a viscous, silicon-based fluid which in turn operates a multi-disc clutch to direct power towards the wheel with the greatest traction. High-revving, smooth, surprisingly torquey and super-responsive, BMW’s 3.2 liter S54 twin-cam straight-six is central to the E46 M3’s character. Arguably the highest evolution of the company’s classic, formerly brand-defining straight-six, the S54 will scream to 8000 RPM, honking through six individual throttle bodies and blaring out a quartet of pipes at the opposite end. It’s one of our very favorite sixes of any configuration, right up there with air-cooled Porsche and Alfa Busso units. Handling was classic M3, with accurate, tactile steering, quick turn-in, and grippy, largely neutral chassis balance readily tipped into predictable, easily-modulated oversteer. Body roll was reduced in comparison with the previous gen (E36) M3, though generally speaking most cars built from 2000-on tend to corner much more flatly than their 20th century counterparts. We can’t describe handling as viceless, as any powerful, rear-wheel drive car has the potential to catch novices off-guard, but suffice it to say the E46 M3’s dynamics are very close to ideal for a fast, versatile sports GT. Cabrios, though heavier (~3,700 lbs) and less structurally stiff, make fantastic summertime cruisers, and though slightly slower and a bit less sharp handling than coupes, can still be great fun to hustle down a tight, twisty road, especially with the top down and the S54 singing at full tilt. Total production for all markets and versions reached 85,766 units, excluding the V8 ALMS homologation M3 GTR, of which just six were built–read more about them here. Of that headline figure, 40,095, or about 47%, were SMG II-equipped examples. Standing for Sequential Manual Gearbox, this second-generation semi-automated manual utilized the same 6-speed gearbox as three-pedal cars, including gear ratios, but with an electro-hydraulically activated clutch facilitating paddle or lever-operated gear changes. Though fast in more aggressive control modes and quite good in a 10/10ths track environment, accelerated clutch wear, the potential for expensive hydraulic pump failure, and jerky automatic mode operation mean that many prefer the standard row-your-own gearbox. Fortunately, as the SMG II utilizes what’s in essence the very same transmission as found in fully manual cars, swapping in a stickshift and third pedal isn’t out of the question, and in fact a small industry of shops has popped up to accommodate those disinterested in the DIY route. Regardless of transmission configuration, body style or other spec details, any well-kept third-gen M3 will deliver the goods in spades. Comfortable, safe, practical and relatively discreet for the day-to-day, or, when the conditions are right, fast and thrilling like few other machines at its price point, the E46 M3 is a modern classic whose status–and value–will only increase in the years to come. ...it was back when BMW Motorsport were serious about winning races. Now their engineers leave for Kia. Respecting the past: embracing the future. 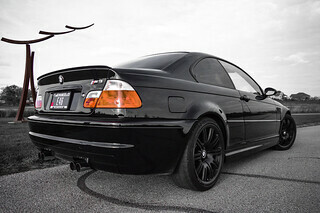 The BMW E46 M3: a driving machine for the ages. Shortly after the turn of the millennium, the BMW M3 E46 burst onto the big stage of the automobile world. What followed was the continuation of an unprecedented success story, which began in 1986 with the purist M3 E30 and manifested itself in 1992 with the M3 E36, which was even more refined and understated. The E46 was the fourth generation of the BMW 3 Series, but only the third edition that BMW crowned with an M3 marque. Series forefather, the BMW E21, had to make do without a sportier model with motorsport genes. AN M3 FOR THE MILLENNIUM. 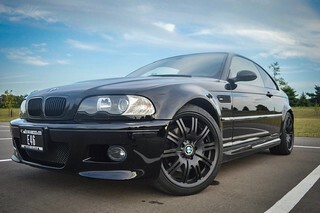 The BMW M3 E46 Coupé took the hearts of real sports car fans by storm when it launched in 2000. With a low weight construction and the high-rev concept of its inline 6-cylinder engine, for many it embodied a return to the virtues of the iconic BMW M3 E30. The following year, a convertible followed, combining a sporty experience and the luxury of open-top driving in an unprecedented way. The number of BMW M3 E46s sold during its production run from 2000 and 2006 – the most successful BMW M model to date. An M automobile never lacks for clear distinguishing features. As with the iconic M3 E30, the M3 E46 is immediately recognisable as the premium model in its series thanks to numerous details. In particular, aesthetic changes such as widened fenders, special side skirts and the modified front apron catch the eye of every observer. These changes also serve an important purpose, mostly in terms of aerodynamics. This also applies to the so-called Gurney flap at the rear: the small spoiler lip noticeably reduces lift and thus improves to traction – crucial in faster corners. From a side profile, the E46 M3‘s chrome-plated gills in the upper part of the front fender are a standout feature. These were originally designed as an air duct for cooling the engine. During testing, however, it turned out that the ducts were not necessary. Nevertheless, they remained – and became such an iconic highlight that their appeal extended beyond just fans of BMW M. Not to be missed are the special side mirrors, which are aerodynamically-shaped to cut through the air. The so-called powerdome, the clearly recognizable curvature of the bonnet, created space for the engine’s powerful intake system. The design of the hood left no doubt that there was a real powerhouse hidden under it. Just like the conventional E46, the M3 also underwent a model upgrade in 2003. In view of the extraordinarily positive response to the previous model, BMW M proceeded very cautiously. Only minor changes, such as the rear lights gaving way to a more modern version with LEDs, were made. The BMW M3 E46 Engine. Outstanding performance is provided by the typical BMW M Series 6-cylinder engine. The 3.2-litre S54B32 engine built on the legacy of its predecessor. Nevertheless, it was an almost entirely new development. It is regarded as the pioneer of BMW’s now well-established high-rev concept, where its only time for the next gear at just under 8,000 revolutions. This emotional and racing-inspired combination helped the M3 to 343 hp peak power (252 kW) and 365 Nm torque – and at the same time to eight wins at the prestigious ‘Engine of the Year’ awards. A cornerstone of this successful concept: for optimum smoothness with maximum performance in various engine speed ranges, the engineers opted for a double-VANOS system. The striking front apron ensures that water and oil always remain in the right temperature window and that full engine power is available at all times. In addition, it enables the cooling of the car’s powerful brake system. With its generous openings, the apron also gives the M3 E46 an unmistakably bold visual character. NO EXCUSES. MOVE FORWARDS. ALWAYS. Buyers of the third generation M3 were able to choose between the 6-speed manual transmission and the 6-speed SMG (sequential manual transmission). The latter is an automated manual transmission, which the driver can operate using the paddle shifters on the steering wheel or the gear lever in the centre console. In contrast to the manual version, gear changes are always sequential and individual gears cannot be skipped. A limited slip differential on the drive axle was, of course, also standard from the start. The variable lock of the transfer case provides the car with a locking effect of up to 100 percent in different conditions for outstanding traction from the corners – and not least allows for spectacular drifts. RACING FEELING IN EVERY CORNER. The striking widened fenders was initially intended to make room for the extra track width in conjunction with a larger contact area of the now wider tyres. The equally elaborate and powerful chassis further contributes to the performance of this high-performance athlete. All in all, these measures resulted in significantly higher cornering speeds than in the conventional BMW 3 Series E46. CSL: three letters that give every M3 enthusiast goose bumps. The BMW M3 CSL is considered the icon and crowning achievement of the third M3 series. With it, in 2003, BMW M consistently achieved everything that the top echelons of the motorsport world had to offer and once again lifted the M3 to a new level. The engineers at BMW M helped do this by making the already well-honed production vehicle an impressive 110 kilos (1,385 kg) lighter. 360 hp powers the BMW M3 CSL's redesigned engine, allowing the high performance coupé to sprint to 100 km/h in 4.9 seconds. With lap times of well under eight minutes on the Nürburgring’s Nordschleife circuit, the BMW M3 CSL advanced into areas that were previously dominated by much more powerful vehicles in the early 2000s. The BMW M3 CSL’s outstanding power to weight ratio. The outstanding power-to-weight ratio of the BMW M3 CSL was made possible by the consistent use of lightweight materials. Composite materials found in motorsport were used in the rear diffuser, front apron, intake and some parts of the interior. In addition, the bonnet was made of aluminum and the rear window of special thin glass. Optional semi-slick sports tyres underscored the racing appeal of the model at its market launch in 2003. However, the highlight can be found above the heads of its occupants: the M3 CSL was the first M model with a visible carbon fibre roof – a feature that has since become an integral part of the BMW M repertoire. LEADING ON ROADS AND TRACKS. The third generation BMW M3 achieved motorsport fame primarily through the legendary BMW M3 GTR Race. From the beginning, mighty fender extensions and a huge rear wing were the unmistakably distinguishing marks of this uncompromising vehicle. The thoroughbred racing car first caused a sensation in the American Le Mans Series (ALMS) 2001, securing BMW Motorsport titles in the driver, constructor and team championships. Later, it was able to prove itself at legendary events such as the traditional 24-hour races of the Nürburgring and Spa-Francochamps – and picked up where it left off at the end of 2001. Two double victories in 2004 and 2005 at the Nürburgring Classic were proof of this. For the 2001 season, the regulations for the GT class of the American Le Mans Series required manufacturers to have a freely available and fully road-legal counterpart. BMW M followed suit and produced a small series of ten BMW M3 GTR Street cars. This version was almost as ferocious as its track-going sibling. The 4.0-litre V8 with a 90-degree cylinder bank angle largely matched the P60B40 engine of the racing version, which had a power output of well over 450 hp. In spite of the strict framework conditions for noise and exhaust emissions, the V8 still delivered more than 350 hp in the street-legal version. In fact, even the smallest detail showed that the extremely limited edition M3 GTR remained as close as possible to the racing car’s dynamics. That included the removal of comfort equipment, while the roof, front and rear aprons as well as the mighty rear wing were made of carbon fibre reinforced plastic, just as in the circuit model. Only then was the impressive curb weight of just 1,350 kg possible. Largely unnoticed by the bright headlights that the coupé and convertible bathed over the years, the engineers and designers of BMW M worked on a spacious M3 in wagon form. The BMW M3 Touring even made it onto the road – if only for testing purposes. In the end, the ambitious project never went into series production. And yet this unique model was able to show how much of a motorsport experience BMW M could inject into a supposed family car. All times are GMT. The time now is 02:17:44 AM.